The vExpert 2015 Announcement has been made by VMware and I’m honoured and pleased to say I have been awarded the accolade for the third year running. I would like the thank Cory (@vCommunityGuy) and the team at VMware for all their hard work vetting the individuals that apply. 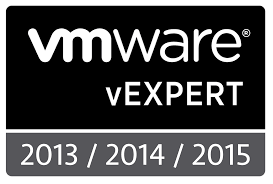 Looking forward to working with many vExperts and attending the many VMware events throughout 2015.